Fans of Pretty Little Liars will be ensnared in this tale of deceit. Christian is hiding terrible secrets from his girlfriend, Lou. But Lou has told lies as well. What if their accidental meeting wasn’t an accident? The first time Lou meets mysterious Christian, she knows he is The One. But Christian is hiding a terrible secret. Why does he clam up every time Lou asks about his past? Why doesn’t he have any family photos, and why does he dye his blond hair black? When Christian’s house goes up in flames, his tires are slashed, and he flees for his life, Lou insists on going with him. But as Christian’s secret is unveiled in front of the whole world, it seems everything he’s ever told Lou is a lie. Can what the media are saying about him really be true? Should Lou trust him? Or is she in grave danger? If it weren't for him, none of us would be in this situation. "In stories ghosts have usually done something terrible - that's why they're stuck here," I tell him, my insides tight. "Maybe some things you shouldn't be able to just forget and move on from. Maybe that's the point." "We all have to live with the consequences of our actions." He sighs heavily. "You can't change the past, however much you'd like to. That's the biggest tragedy of all." "Is not telling the truth the same as lying?" he asks. "Is a white lie still a lie?" Little White Lies is a thought provoking story of guilt and innocence, prejudice and judgment. It's a moving and insightful tale that makes you stop and wonder about things like the justice system and how bullet-proof it really is, or how seemingly unimportant decisions can turn into real pivotal points of our lives, altering our fates in unpredictable ways. It's also a story of lies and regret, and - ultimately - of trust, love and forgiveness. This book is about Lou (not her real name), who assumes a new identity and moves from London to Sheffield, trying to escape her tragic past. There she meets Christian, who also moved there not long ago. These two connect right away and they seem perfect for each other - almost destined to be together - but Christian is obviously keeping secrets. He's always busy and running off somewhere, never stays for a drink after work and doesn't want to go on a date with Lou for reasons only known to himself. Is he hiding something? And what about Lou? What is her reason for running away and starting a new life? There's so much more to these two than you could ever imagine... They both have secrets and they both are lying.. The question is: why? Every now and then, I like a book thoroughly grounded in reality, one that isn't too far fetched or completely unlikely. Little White Lies has a very believable plot. The characters are on the realistic side and it's easy to get absorbed in their stories, easy to care about the outcome. I liked Lou and Christian, as well as Kenny and Vix (the side-kicks), I even liked Gran (Lou's grandma) even though we didn't see a whole lot of her. They didn't exactly sweep me of my feet and I didn't lose any sleep wondering what will happen to them, but I did care about them and thought they were well developed. I am a big fan of Katie Dale's writing style. She's really great at writing books that are heartfelt and meaningful, filled with powerful messages, thought-provoking themes and a whole spectrum of feelings. Little White Lies isn't especially fast-paced or action-packed, but neither was Katie's previous book, Someone Else's Life. They're both rather mellow contemporaries that explore some difficult themes (Someone Else's Life is, among another things, about Huntington's disease). I really enjoyed reading both and I think fans of Katie McGarry and K.A. Tucker will have a really good time with them, too. Especially with Little White Lies. Overall, Little White Lies is a good book - well plotted, captivating and meaningful. It shines a new light on some important things, like police investigations that aren't thorough enough to uncover the truth (at least the WHOLE truth), lying about the evidence and vigilantism. This was quite a fascinating read and I'm now even more excited for Katie Dale's next book! 1) How would you describe it to those who haven't heard of it yet? Thanks so much for having me! 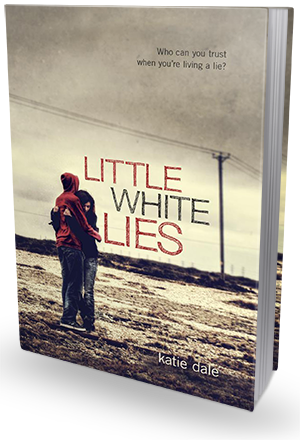 LITTLE WHITE LIES is a thriller that deals with issues such as justice, loyalty, identity and guilt. Lou Shepherd takes the opportunity of starting at university to reinvent herself – completely! She dyes her hair and changes her name in an attempt to hide her past – but then she meets a guy who doing exactly the same thing, for very different reasons. Why does Christian clam up every time Lou asks about his past? Why doesn’t he have any family photos, and why does he dye his blond hair black? Lou finds herself falling for Christian, so when his house goes up in flames, his tires are slashed, and he flees for his life, she insists on going with him. But as Christian’s secret is finally unveiled in front of the whole world, it seems everything he’s ever told Lou is a lie. Can what the media are saying about him really be true? Should Lou trust him? Or is she in grave danger? And was their chance encounter really an accident at all…? 2) Who or what inspired you to write Little White Lies? I actually went to Sheffield University, where the story is set, so that was a big inspiration. Plus I’ve always been interested in stories that deal with people who, for whatever reason, have to change their identity, from TV series like The Americans to When I was Joe by Keren David. How do you stay true to yourself when you’re lying about your identity? Where do the boundaries between truth and fiction blur, and who can you really trust? And how can they trust you when you’re lying about everything? I was really interested in exploring these issues with Lou. It’s always very important to me to try to get my facts right and be as accurate as possible when I write about subjects I have no prior personal knowledge of, and consequently (as I’m not writing an autobiography!) I find every book requires a lot of research. As LITTLE WHITE LIES is a thriller, it also took a LOT of planning – more than any book I’ve written before – so that I could make sure I was dropping the right hints and clues in the right places so that hopefully the twists and turns will come as a surprise, but on rereading you’ll see the breadcrumbs I dropped for you along the way. 4) Is there a message in your novel that you want readers to grasp? There’s not really a “message” as such, but I always like books that deal with controversial issues and moral dilemmas, as I often pick them up thinking "well, I know what my opinion on this subject is", but as I keep reading I find myself sympathizing with all the many and varied characters, and end up being able to see all the shades of grey of an issue that is more complex than I had originally thought – which leaves me with food for thought long after I finish reading. That’s what I’ve tried to do with both SOMEONE ELSE’S LIFE and LITTLE WHITE LIES. So I guess if there’s any message it’s “don’t judge a book by its cover”. Hopefully some of my readers will feel this way after reading LITTLE WHITE LIES. 5) What are some of your literary inspirations? Favorite books/authors? I love Jodi Picoult’s books for exactly this reason! I always end up empathising with all of her characters – even when they’re at logger-heads with each other! – which I find makes it a much more involved and interesting reading experience. 6) If your book had a soundtrack to go along with it, which songs would be on it? here are the songs that I think would be perfect for the soundtrack to Little White Lies…and why. Starting university is all about reinventing yourself, but Louise Shepherd has gone a step further, even changing her name in her bid to hide her true identity from everyone she meets. Until she bumps into an old school-friend, Kenny. He promises to keep Lou’s secret – but can she trust him? Lou’s cousin Poppy’s favourite song, this reminds her of home, and of the best friend she let down so terribly. When Lou meets tall, dark, and handsome Christian, she knows he's hiding something. Why does he clam up every time she asks about his past? Why doesn't he have any family photos and why does he dye his blond hair black? Suddenly Christian’s terrible secret is unveiled to the world - and it seems everything he's ever told Lou is a lie. Should she stand by Christian, against the whole world? As Lou’s heart battles her head there is just one question: Who is the real Christian? But Christian isn't the only one keeping secrets. For what if their chance meeting was no accident at all...? As lie follows lie, nothing is as it seems, and soon Lou finds herself ensnared in a web of deceit, her loyalties torn; her emotions in tatters. As Lou finally discovers the truth, she faces a heart-wrenching dilemma: should she shatter the lives of those she holds dearest, or betray the guy who, against all odds, she's fallen in love with? 7) Christmas is right around the corner and we're all getting excited for it here, at Bookish. Do you have any special Holiday plans or family traditions? Yes! 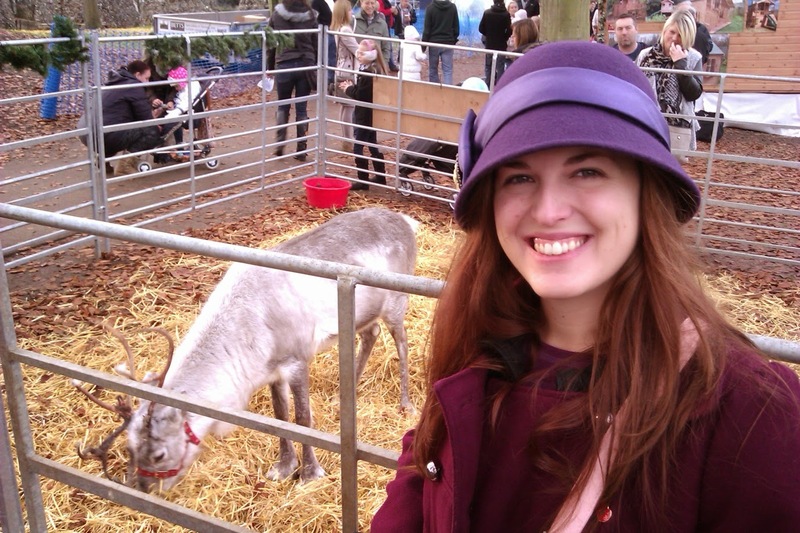 Every year, I try to go to the Christmas Fayre where they have brass bands and rides and lots of stalls selling crafts and gifts and mulled wine (I LOVE mulled wine) and even real live reindeer! Then on Christmas Eve my family always goes to watch the nativity play, then come home for mince pies and more mulled wine (naturally!) and always ALWAYS watch The Muppets Christmas Carol before bed – it’s my absolute favourite day of the year. 8) Any New Year's resolutions? Oh gosh - too many! They’re always pretty much the same every year (stick to a daily word target, exercise more, east less chocolate) – which must mean I’m really bad at keeping them! 9) What books are on your December TBR pile? SO many! But top of the heap are Jodi Picoult’s new book LEAVING TIME; Paula Rawsthorne’s BLOOD TRACKS and Teri Terry’s SLATED trilogy. 10) Last question! I'm super curious and I'm sure your fans are all wondering about it too: are you working on your next book yet? If so, when can we expect it? Can you share some juicy details to keep our appetites going? I’m actually working on a range of books at the moment – from picture books to a series for 9-11 year-olds, and of course my next YA, but unfortunately at the moment I’m sworn to secrecy – but I promise I’ll let you know as soon as I can!